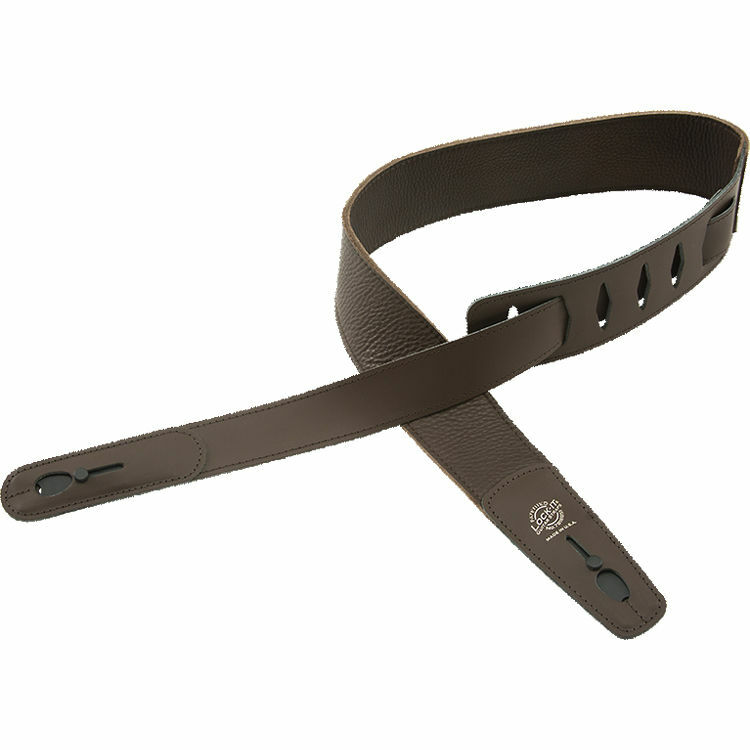 2-3/4" Wide & Adjusts from 36 to 60"
The brown 2-3/4" Leather Guitar Strap from Lock-It features a stitched edge and has a snap-action lock to prevent the instrument from becoming unfastened. The guitar strap is adjustable from 36 to 60" and can be used with a built-in thumb-back button, which securely attaches it over the guitar's end-pin and locks the strap securely in place. The snap-action locks are made of polymer-alloy components for toughness and long life. A specially designed spring powers automatic locking and assures lock recovery. Plus, it has been designed to bend, take abuse, and remain working for many years. 2-3/4" Leather Guitar Strap (Brown) is rated 5.0 out of 5 by 5. Rated 5 out of 5 by Frontier King from Exceeded All Expectations I am finally able to take my Ramirez SP to a stand up gig. I needed comfort, security and safety for this guitar - and this if the first strap to provide for all three requirements. Comfort: The generous padding on the strap allows me to play without physical fatigue; Security:It takes the full burden of the guitar, although it does not allow me to let it hang from the strap (it would tip) Safety: My biggest concern was damage to the top and sound-hole area of the guitar. The thoughtful padding and use of felt insert on the nylon hook completely eliminated the concern. I will be buying more straps from this source for my other guitars. Rated 5 out of 5 by Lef T from Total Satisfaction I am totally pleased with this strap. Nice leather,well built,ingenious locking system. B&H have it for a no brainer price. I ordered by phone. Excellent service and ultra fast shipping. Rated 5 out of 5 by Jay Ira from Best strap ever!! Super easy, very secure locking mechanism works on all my guitars. This can be reversed so that it can be used on SG and ES-335 type guitars also!